[ Eliza Weaver Bradburn, children's author and daughter of Rev. Samuel Bradburn, 'the Methodist Demosthenes'. ] 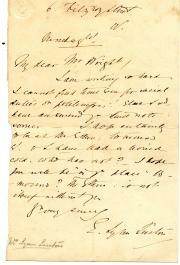 Autograph Letter Signed ('Eliza W. Bradburn') [ to Rev. S. Walker ] regarding the sale of her 'little books', and her 'Missionary capes'. 'At G. Laishley's Esq. | 71 Finchley New Road | St. John's Wood | London'. 5 December 1856. 3pp., 12mo. Bifolium. In good condition, lightly aged. The letter indicates that Bradburn was deriving some sort of income from the sale of her books, and was making 'Missionary capes', possibly for charity. She writes that she is concerned that 'the two notes written to Mrs. Walker and the one to yourself, were not received', and asks whether ''the Missionary Books' and magazines were sent to him as ordered, 'I trust Mr. Thomas Walker had the dozen for which he kindly prepaid me.' 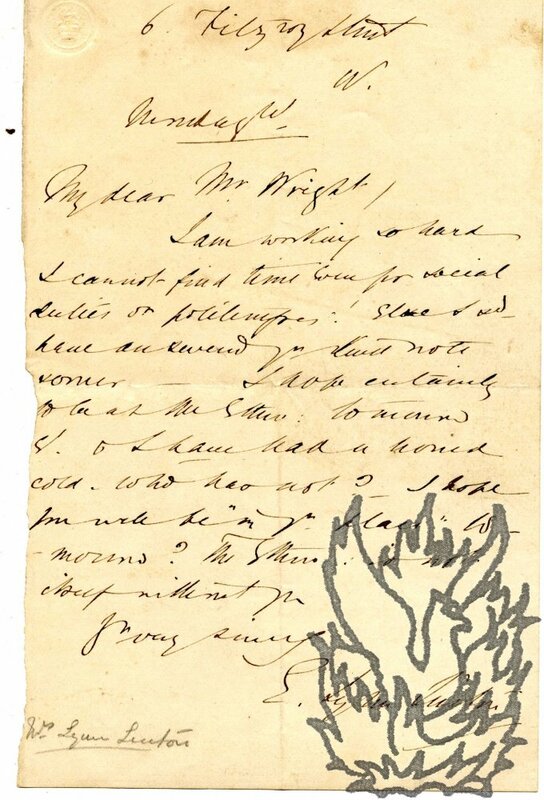 She has 'an affectionate respect for Mr. and Mrs.
Autograph Letter Signed from the English poet Eliza Cook, sending what she describes as a 'specimen' of her 'pothooks' and hangers': a holograph poem titled 'Impromptu on being told the death of my Mother would leave a scar on my heart'. 9 Gloucester Buildings, Old Kent Road [London]. 11 December 1845. 2pp., 4to. Bifolium. In very good condition, on lightly-aged paper, with minor evidence of previous mounting. Apparently addressing an autograph hunter, she writes: 'I beg to forward you a specimen of my "pothooks and hangers" trusting you will "admire" if you honestly can. Believe I have pleasure in gratifying your request and am with truth my dear | Ever yours faithfully | Eliza Cook'. The poem, also signed 'Eliza Cook', is four lines long, beginning 'That stroke indeed would deeply gash'. There is no indication that the poem was published. Autograph Note Signed ('E. Leslie -') by the American author of popular cookbooks and works of etiquette Eliza Leslie [Miss Leslie]. No place. 14 October 183<4?>. 1p., 4to. On aged paper, in two pieces, lightly-attached to a piece of backing paper. The text of the note and the signature are intact on the upper part of the letter, but the name of the recipient is lacking. The note reads '- May I ask you to advance me fifty dollars on account of the souvenir - Being disappointed in receiving some money that I expected from Boston, I am just now quite at a loss. | Yours | [signed] E. Leslie -'. Leslie's story 'The Souvenir' was first published in 1830 in 'The Pearl', and republished in 1832 in 'Affection's Gift'. Autograph Letter Signed ('E. Lynn Linton') from the author Eliza Lynn Linton to an unnamed editor or publisher, calling for 'a brilliant critical notice of Massinger's works', and suggesting that W. E. Henley write it. Rodney House, Littleston [Littlestone] on Sea, Kent, on letterhead of Queen Anne's Mansions, St. James's Park; 27 March [no year]. 2pp., 12mo. Good, on lightly-aged paper. She hopes that she may, 'without being needlessly intrusive', suggest that 'someone, well up on the Elizabethan dramatists, should write a brilliant critical notice of Massinger's works'. She thinks that it would be 'a means of advertisement of great value' if the recipient could 'find the writer & the vehicle'. She suggests 'W. G. Henley of the New Review', who 'has all the literature of that time, & before, at his fingers ends. Eliza Lynn Linton [Elizabeth Lynn Linton] (1822-1898), author and opponent of women's suffrage. On letterhead of Whittington Hall, Carnforth, 'c/o the Countess Ossalinsky | Musgrave Hall | Penrith'; 7 September . 4pp., 12mo. Fair, on lightly-aged paper with slight discoloration to inner margins from previous mounting. She thanks Alice for her 'sweet letter', and declares that she has had 'a very very pleasant visit here. I like my friends here extremely. They are my sort for all that they are strong conservatives, and they are so simple, so homely, so gentle, & I get on with them as well as - what shall I say? . as well as with you! Autograph Note Signed "E. Lynn Linton", novelist, to "Mr Wright". 6 Fitzroy Street, [London] W., no date. One page, 12mo, edge trimmed with minor loss of text. She is working too hard to find time for "social duties or politenesses" She will be at a certain place the following day. She has a cold "who has not?") abnd asks whether he will be in his "place" the following day. On a piece of pink paper, roughly 9 x 11 cm. Neatly laid down onto a piece of white paper. Very good. A reply to a request for an autograph. Reads 'I am | my dear Lady | Yours truly | [signed] Eliza Cook'. The signature is firm and bold, with a small part of the flourish beneath it shaved away. Autograph Letter Signed ('E: Lynn Linton') to 'Miss Shapland'. Thursday' [no date]; on letterhead of Brougham House, Malvern. 12mo: 3 pp. 26 lines of text. Good, on lightly creased and aged paper. Chatty, apologetic letter. She thanks her for her invitation for the following day but she is already engaged. Unclear reference to 'Sir Boyle Roche's bird'. She would like to see her again, but 'I dare not make any engagements now, The weather is now my jailer'. She has to go to Malvern one day the following week. Suggests other possibilities. She may have to 'take my chance of finding you at home'. She was 'sorry to miss you when you were away & I called'. Autograph Letter Signed ('Eliza Hamilton') to Cecilia, wife of James Losh (1763-1833) of Jesmond. Two pages, quarto. On aged paper, with several closed tears and loss at foot and remains of stub in margin, but with text clear and entire. Autograph Postcard Signed to 'Mrs. Black'. Novelist and miscellaneous writer (1822-98). Dimensions roughly five inches by three. Grubby and with minor fraying, loss and closed tears to edges (not affecting text). Printed halfpenny stamp and two postmarks in black ink. Addressed to 'Mrs. Black | 5 Hazlitt Road | W. Kensington | W.' 'I have not received ye Ladies Pictorial, but fine - all very well done with great sympathy & tenderness & so well written - I have begun by informal LSaturdays - & shall be very glad to see you if you could come'. Signed 'E: Lynn Linton'. Autograph Letter Signed to T[homas]. F[rederick]. Dillon Croker. Tooles Theatre | Strand'. No date, but in envelope postmarked 15 July 1876. British actress (born c. 1836). In the 1881 census Johnstone features as a visitor in the house of the actor-manager John Laurence Toole (1830-1906). Three pages, 12mo. Good, though grubby and with a few stains. In envelope with penny red stamp and black wax seal, addressed to Croker at 9 Pelham Place, Brompton. 'I return your book my father having complied with your request | I can not tell you the great pleasure I received in looking over your lovely collection. It is so good it makes one almost envious.' Signed 'Eliza Johnstone'.